During the 2012 London Olympics, Claressa Shields stood in the ring, stone-faced and focused. Her opponent was tough, but was not nearly as tough as the obstacles Shields beat to get to this very moment. With every jab, every uppercut, every blow, Shields thought about why she needed to be triumphant. She needed to win for herself and her hometown of Flint, Michigan. Most importantly, she needed to win for her family. The football head injury conversation more and more people are having is a complicated and multifaceted one. One of the reachable conclusions is obvious, though: a confluence of related factors could conspire to bring about the “end” of football as we currently know it. Many people often immediately retort, “No!”, maybe because they like football a lot and don’t want it to end, but also, they say, there’s too much money in football, it’s too big of a business, and it’s way too popular and ingrained in our culture to go away. And the first person might then bring up boxing. To put the thesis statement at the end of this opening paragraph, the point, for those, like Jonathan Mahler, who might miss it, is that if a sport as widely popular and culturally ingrained as boxing could fall from prominence, so too could football; in other words, that football is America’s most popular, wealthy, culturally relevant sport is no defense to the claim that it might lose that status, because a once-similarly situated sport– boxing– did lose its status as such. Mahler, a sports columnist for whatever Bloomberg View is, captured readers with the headline “Why Football Won’t Go the Way of Boxing (Yet)” and his thesis is that football won’t follow boxing’s decline because boxing’s decline was the result of television-related changes, not “brutality.” The issue that vitiates the analogy is not the specific reason for the decline, as Mahler believes, but it is the fact of the decline itself. Yes, Floyd’s still doing his thing, although his thing seems to be less and less about boxing these days. Mayweather is thirty-five years old and still undefeated, the pound-for-pound champion of the sport, the self-proclaimed face of boxing. His mix of wealth and outspokenness keeps him relevant even as, for a variety of reasons, he fights less frequently. Juan Manuel Marquez’s knockout of Manny Pacquiao earlier this month only serves to complicate the question of whether Pacquiao and Mayweather ever will fight. Unlike my more complete, early assessments of Bill Simmons’ Grantland and Clay Travis’ OutKick the Coverage, The Classical has been subjected to less exacting treatment here, in part, I think, because I have yet to pin down a describable essence of the site upon which to hang a similarly descriptive post. This is due, in part, I think, because The Classical itself hasn’t quite pinned itself down. A quick, supporting example: while David Roth’s emergence as a primary voice on the site is not in any way unpleasant, the apparent vanishing of The Classical’s star editor-in-chief, Bethlehem Shoals, is at least mystifying. If I had to register a conclusion at this point, it would be that, though still finding its way with its general readership, the site at least appears influential as a blogger’s blog, evidenced, in part, by the emergence of the transcript-style dialogue features at places like Grantland and Deadspin. And now that I’ve wholly unnecessarily exhausted my quota of commas for the week, it’s time to move on to the substance of this post. The interview was the result of a happy confluence: a champion who delighted in talking like virtually no athlete before or since, and some precocity cases from Winnetka, IL’s New Trier High School who had the pure high-school balls to cold-call that champion and get him out to a high school campus for an interview. 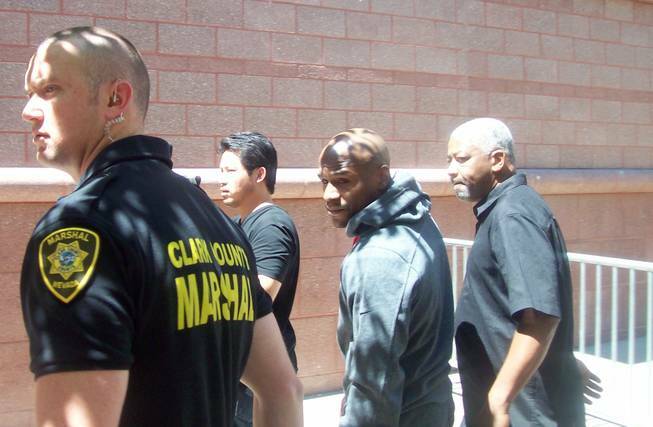 Floyd Mayweather is in jail. He doesn’t want to be in jail, and he especially doesn’t want to be in solitary confinement. And even though his confinement hasn’t prevented him from winning a fourth ESPY as fighter of the year or becoming the highest paid athlete in the world (and interestingly, the only member of the top 25 on that list to get there with $0.00 in endorsements). Perhaps we, the writers and readers of ALDLAND, should collaborate to send Floyd a letter. Please add your contribution in the comment section, below. What really happened in the Pacquiao-Bradley fight? I do love conspiracy theories, and there’s no better way to end a Sunday or start a Monday than with a video like this. Timothy Bradley’s win by split decision over Manny Pacquiao was much maligned by media of all stripes, and even Bradley’s camp seemed a bit tentative in the aftermath of a victory over someone considered one of the top two fighters in the world.